REVIEW - I Am Bread - Use a Potion! It’s an age old question; just because we CAN do something, should we? Whilst there are plenty of occasions when so called ‘inventors’ should have asked themselves this, it’s something that developers Bossa Studios, creators of cult hit ‘Surgeon Simulator’, didn’t think twice about when creating ‘bread simulator’ I Am Bread. That’s right – bread simulator. Whilst we live in an age where the simulator genre is at its peak, a ‘bread simulator’ is perhaps the most bizarre of all. The question is are Bossa Studios successful in creating an authentic experience of living life as a slice of bread? 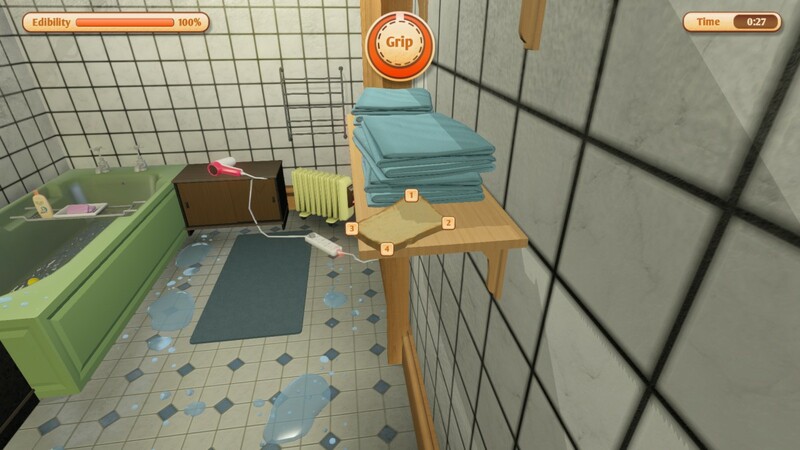 The premise of the game is simple – you control a wholemeal slice of bread as it leaves its family in the loaf in order to achieve its ultimate goal of becoming toast. 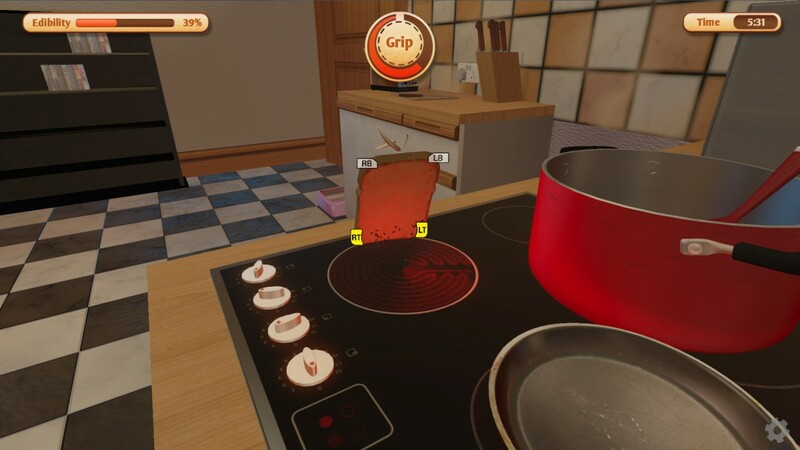 You control each corner of the bread as it crawls, drags, climbs and throws itself through an assortment of home-themed levels all the way to golden brown, toasted glory. It sounds simple but it isn’t; it’s important you keep the edibility of the bread at a high level – spend too long on a carpet, a dirty wall or down a toilet and your lifelong dream of becoming toast is over. It sounds ridiculous but somehow, by some miracle, the absurdity of the game manages to bring out a charming and enjoyable experience. Controlling the bread is simple; each corner of the slice is allocated to a shoulder button. As long as a corner is making contact with a surface you’re allowed to effectively cling on by holding the appropriate shoulder button and then drag your way through by pushing the left stick in the appropriate direction. If you have matching shoulder buttons down you’ll be able to flip yourself across areas. It sounds complicated, but it’s really not – it’s actually the most accurate representation of bread controls I think we’ll ever come across in a game. You’re also able to attach to stationary objects and move them around – I caused a lot of destruction on my journeys be it smashing plates and glasses or in one case dropping a bowling ball onto a TV, the inevitable destruction creating a makeshift toaster in the process. All this traversing of the map isn’t pointless though – the ultimate goal is to become toasted. The most simple method of this is to get in a toaster – of course, that isn’t always possible in this game so at times you have to become creative. Sure, in the kitchen you could just turn on a stove and cook yourself. What about in other rooms though? A few methods I used for toasting along the way were by using an iron, by striking a match (that’s right – I managed to make my bread strike a match) and using it to light a BBQ or, perhaps the most destructive of all, by blowing up a petrol station and toasting in the ensuing flames. There are countless methods to achieve toasted glory; it all comes down to how creative the player is. If you think this sounds like a simple process you’re in for a shock – I Am Bread is a tough game. The controls, whilst effective, are pretty chaotic at times. You won’t always be able to line up each corner to a suitable surface, sometimes leaving you in a situation where your only choice is to release all grip and hope for the best. This will often result in failure – the previously mentioned edibility of your bread will drop quickly if you land on the floor or on a dirty surface. The unpredictability of the physics, though essentially a key feature in what makes the game work so well, can also result in your downfall. Things won’t always work out how you expect them to; whilst frustrating at times a lot of the entertainment is also provided from this. It can’t be held against the game. 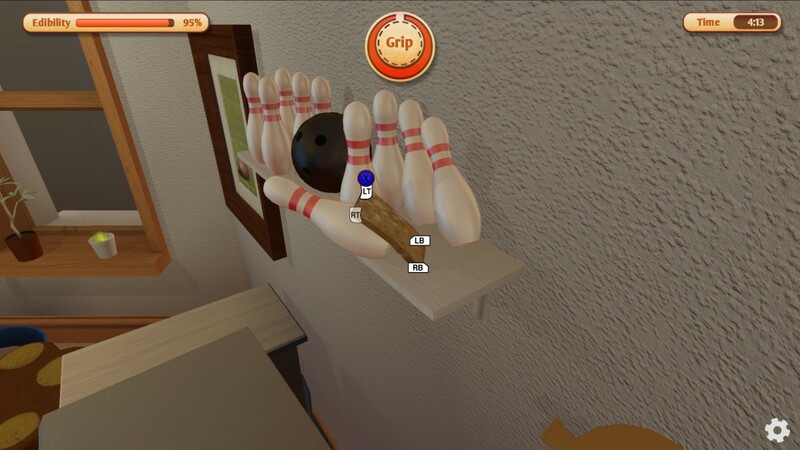 You also have a grip meter – you can only hold on to a surface for so long before your slice will be forced to let go, resulting in a tumbling fall. These falls don’t always result in failure, but it can be very frustrating when you’ve worked so hard to work up a tricky obstacle only to find yourself losing your grip just as you’re about to reach your goal. I’d be remiss not to mention the awkward camera. Whilst generally it’s fine, keeping a clear view on your slice and surroundings, many failures of mine were due to the camera being blocked by and awkwardly placed obstacle. It’s not a constant problem, but it is frustrating when you’re in a situation where you have fallen to a dirty surface and have to react quickly, only to have the camera hinder this process and block your view. Whilst it does have its downsides I Am Bread is a very enjoyable game. The destruction you cause whilst traversing through levels is insane; who would’ve thought baked goods cause so much chaos? Whilst progressing through the story mode you’ll also be ranked at the end of each level based on time taken, edibility and how well toasted your slice is. The best score I achieved was a C and I was proud of that; it offers plenty of replay value to those who want to come back and try to get a higher score though. For those who are tired of the story mode there are plenty of other game modes to try out, offering you the option to take control of other baked goods too. You have the ‘bagel race’ – a mode where you race through checkpoints as a bagel trying to achieve the fastest time possible. There are the ‘rampages’ where you rage through levels as a baguette, achieving high scores by destroying everything in your path. Are you a cheese fan? 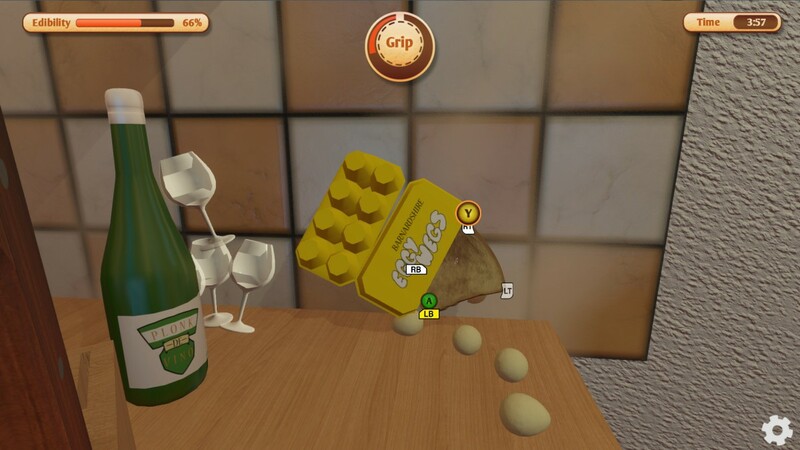 Then ‘cheesehunt’ is for you; you control a cracker as it seeks out hidden pieces of cheese in a level, their locations given away by the visual effects of ponging cheese. Perhaps the most bizarre extra mode of them all is the ‘zero g’ mode, where you propel your bread slice through zero gravity levels with rockets attached to each corner. All these modes are utterly insane but so enjoyable, adding an extra dimension to the already crazy gameplay. Incredibly each savoury treat manages to control so differently, really changing up the gameplay and keeping things varied and entertaining. The aesthetics of the game are simple, each area you visit looking pretty with a cartoony style. It won’t receive any awards for the best graphics in a videogame but the graphic style works effectively with the game. Who said a bread simulator needs to be a graphical masterpiece? Either way you won’t find yourself getting bored of the graphics as each level is carefully designed and varied. I Am Bread has positive sound design too – the upbeat piano music playing in the background is charming and adds to the comical value of the game. Each piece suits the vibe of the game and I actually found myself humming along with some of the tunes. The sound effects are well utilised too; be it the destructive crashes and smashes you’ll create on your journey or just the noises of engines running and bread burning. The developers have done a good job and it keeps you fully immersed in the experience. I never thought I’d be playing a bread simulator in my lifetime, it really is an absurdity. I can honestly say though that I’m glad I did – I Am Bread is a charming, entertaining experience that I’d recommend anyone to try at least once. You really need to experience the insanity of it all. It does have it’s downsides with the high difficulty, sometimes awkward controls and camera angles causing issues along the way. It doesn’t stop it doing what the developers intended though: provide a silly, fun experience like nothing you’d have ever played before. With a variety of levels and game modes to play through you’ll be kept entertained for hours. I mentioned at the start of this review that just because we can do something, should we? In I Am Bread’s case the answer is an astounding yes.